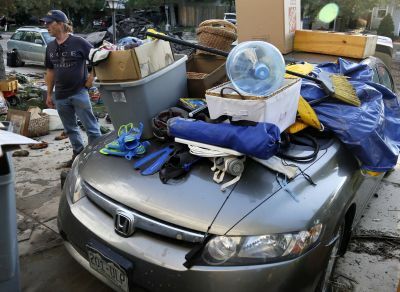 WASHINGTON (CNS) — Mary Jurgensmeier, a member of St. Peter Catholic Church in Greeley, Colo., said she knows people in her community who have lost everything. 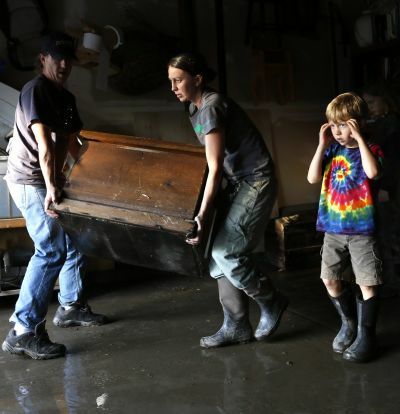 Jurgensmeier is one of thousands of Colorado residents who have been displaced from their homes in the flooding caused by several days of torrential rains that began Sept. 11. She said she and her husband returned to their farm, which is located about three miles east of Greeley. Jurgensmeier said there was no flood damage to their home, which is located on a knoll. “We are one of the lucky ones,” she told Catholic News Service in a telephone interview. Jurgensmeier, however, said there has been damage to agricultural property on their land. She said floodwater is still covering their pasture. Jurgensmeier said St. Peter has been working to aid families since the onset of flooding in Colorado. She said her church has gathered clothing for victims. Father Matthew Hartley of St. Peter said the church is trying to help as many families in the area as they can. He said St. Peter has opened up its food bank. “The big thing is meeting immediate needs,” he said. Father Hartley said four families at St. Peter have lost their homes because of the flooding. “It’s a very difficult time,” he said. The priest said many organizations have worked to help victims, including Catholic Charities of Weld County, which is in the Denver Archdiocese. Enita Kearns-Hout, regional director of Catholic Charities of Weld County, said Catholic Charities brought blankets to displaced families at the Greeley Recreation Center shelter. Kearns-Hout said one will see devastating sights around Weld County. She said many families have lost everything. Kearns-Hout said many homes in Weld County have been tagged as uninhabitable because of flood damage. “The greatest need is for families to find a place to rent,” she said. Kearns-Hout said Catholic Charities is a go-to center for those of any faith. “One of the blessings is that we have collaborative partners,” she said. Red Cross employee George Sullivan is also part of the Denver Metro Area Knights of Columbus Second Responders Program. Sullivan said the program’s volunteers have helped care for flood victims in northern Colorado. Dennis Hughes, operations section chief of the Second Responders Program, said the availability of basic care for flood victims is the top priority. Hughes said the needs of displaced victims include food, shelter and a clean place to live. Hughes said the Knights’ Second Responders serves a 50-mile area. He said the program was contacted by the Red Cross to help provide food for victims. Hughes said he and the team cooked hot dogs and set up a continental breakfast at a high school in Commerce City. He said Second Responders initially fed a group of 100-120 people, however they prepared food for 250. “Other brother Knights from Wyoming and Kansas have come in to assist with mass care and feeding,” Hughes said. Sullivan, who lives in the Denver metropolitan area, said the flooding was not confined to any one area. “It’s a dynamic and evolving disaster,” he said. Sullivan and his district director Jason Godinez said their homes were not damaged by the flooding. Sullivan said Godinez has been working 18 hours a day since the onset of the floods to care for residents of his district. Sullivan said he also has not slept much in the past few days. 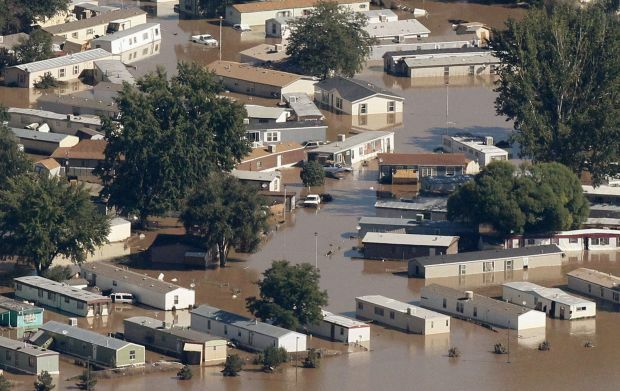 According to a statement issued Sept. 17 by the American Red Cross, thousands of people in Colorado have been forced to evacuate their homes because of flash flooding. The Red Cross was working with the Colorado National Guard and local emergency management chapters to ensure that all in need were being helped. More than 20 response vehicles and six trucks with relief supplies for victims were launched. The Red Cross also was assisting flood victims in Utah, Arizona, New Mexico and Texas.